What is the paleo diet, how do I know if the paleo diet is for me, how to make a 1-day paleo meal plan? This and delicious paleo recipes all in one post. What the heck is the Paleo Diet anyway? In a nutshell: it’s a diet where you try to eat the way humans ate when they were in the Palaeolithic era. A diet that suggests eating everything we ate when we were hunters and gatherers, or any food before the agricultural revolution. That excludes all grains, legumes, dairy (except for butter and ghee for some people), hydrogenated oils as well as refined sugar and anything containing refined sugar. Basically, all processed food. The motto here is: eat real food! To read more in depth info about this check out this article. 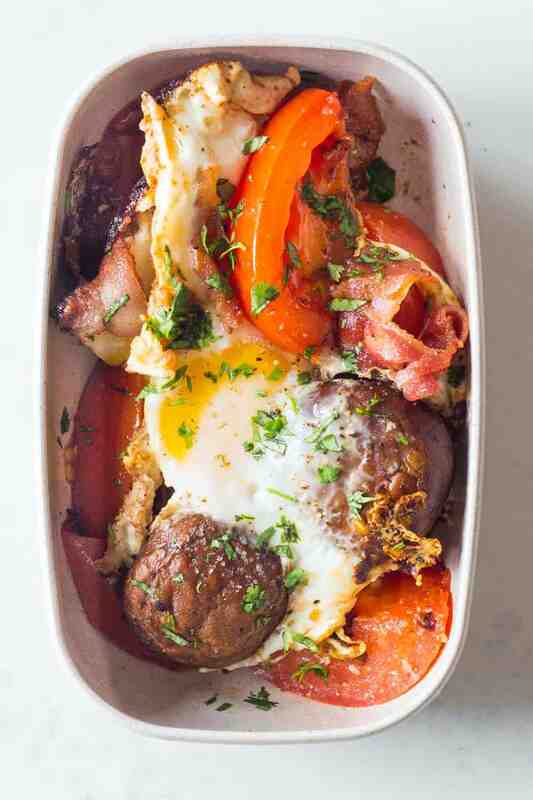 A healthy Paleo breakfast for your Paleo Meal Plan – pan-fried bacon, tomato, mushrooms, eggs and parsley. 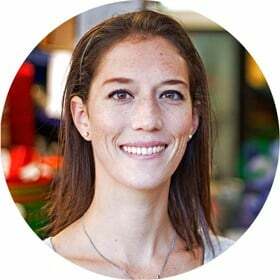 One very important point about the paleo diet in general and the paleo meal plan specifically is that this diet discourages calorie counting or tracking. Your body knows exactly how much it needs to eat and there is no need for any calculator to guide you. Something I personally love about this diet is that it encourages you to listen to your body and thus fosters a healthier relationship with food in general. Something I’ve always done, still incorporate in my own clean eating meal plans, and encourage my children to do on a daily basis. Listen to your body! Not your mind playing tricks with you and telling you “OMG I want moooore because this is sooo delicious”. Ask your body, am I still hungry or is this just a craving? 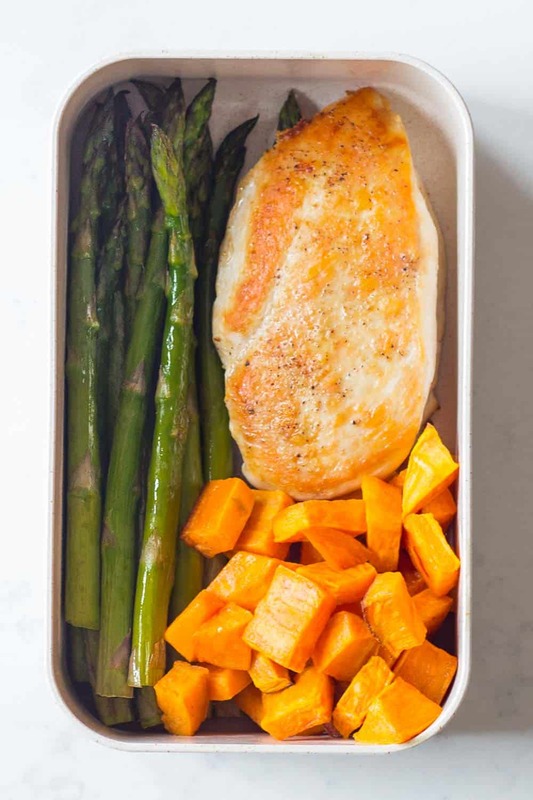 A healthy Paleo Lunch for your Paleo Meal Plan – pan fried chicken breast with roasted sweet potato and asparagus. 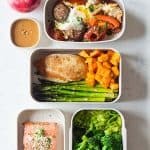 What can I include in my Paleo Meal Plan? 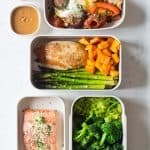 So, considering there are quite a few restrictions in the Paleo Diet, what exactly can be included in a Paleo Meal Plan? It’s much easier than one might think. Just like with any healthy meal plan, the mantra is: keep it simple! 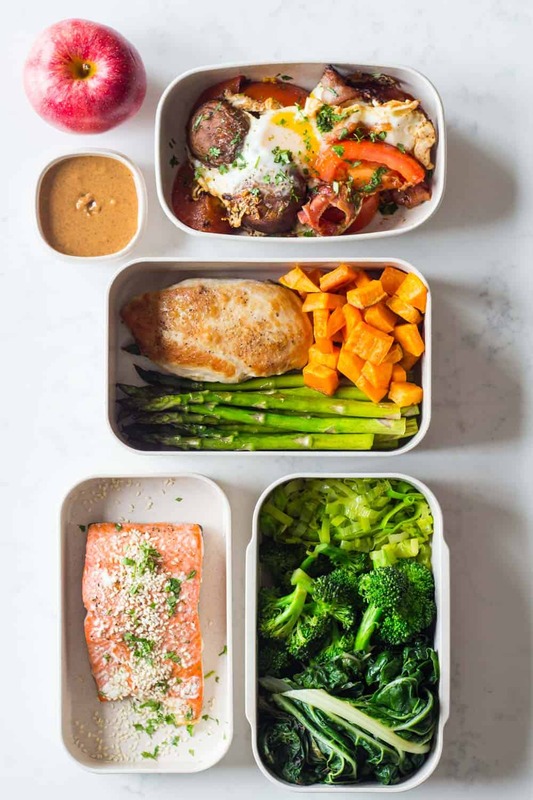 A Paleo meal plan should be high in natural fat, moderate in good quality protein, low in healthy grain-free carbohydrates and it should include plenty of vegetables. I feel like the easiest way to plan for the paleo diet is to think “protein+veggie made with or in natural fat“. 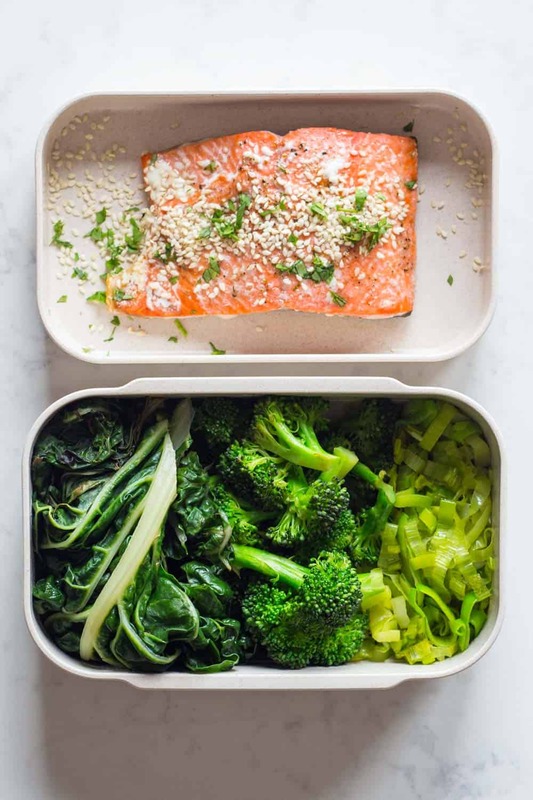 A healthy Paleo dinner for your Paleo Meal Plan – Oven-baked salmon fillet served with sautéed leek, broccoli and swiss chard. Paleo Diet the Healthiest Diet? Is this the best diet for me if I want to be healthy? Short answer: Maybe. Long answer: This depends on your health situation, your metabolism, your cultural understanding and upbringing, your personality, your goals, your current diet. Before starting ANY new diet it is always advisable to talk to your physician and/or nutritionist to see if the diet you choose to follow is safe for you. There is no such thing as a one-size-fits-all. There are for sure people that should avoid grains (or better said gluten) and dairy. Not all of us need though however, some of us might look and feel better eating grains and legumes in moderation. So for those who do, this might not be the healthiest diet. If you are currently on what many define as the Standard American Diet – a high sugar and sodium diet including a lot of processed foods – you most certainly are better off eating a Paleo Diet. There is also studies being conducted to find out the effects of this diet on people suffering from certain diseases or other health issues and it seems to have an extraordinary effect on their health so for these people the paleo diet might after all be the healthiest diet of all. So in the end in comes down to you and your body. To read more about the pros and cons of the paleo diet in order to be able to make up your mind and find out if this could be the healthiest diet for YOU, check out this article. 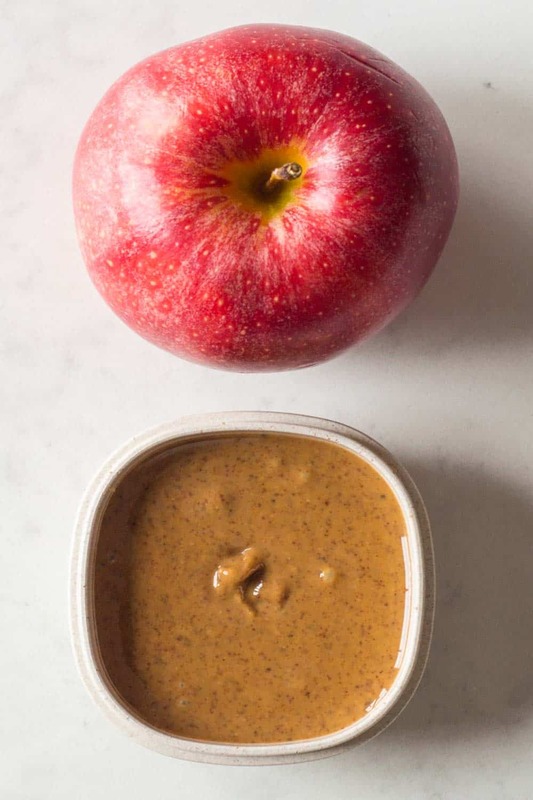 A healthy Paleo Snack for your Paleo Meal Plan – apple slices dipped in almond butter. Breakfast: Preheat skillet over medium heat, then add bacon and fry until half way to being crispy, add washed tomato cut in half cut side down, remove stems from mushrooms and add stem side down, crack 2 eggs into remaining space and continue to fry until egg reaches desired doneness. Sprinkle with freshly chopped parsley. If you like your egg white well cooked you might want to cover the skillet with a lid for the last minute or so. Lunch: preheat oven to 400 F (200 C) and preheat skillet over medium heat. Peel and small dice sweet potato; wash dry and remove hard part of asparagus; add diced sweet potato to a small baking sheet add a splash of avocado oil, sea salt and pepper and roast for 15 minutes. Add a splash of avocado oil to skillet, salt and pepper chicken breast and fry chicken breast for approximately 6-8 minutes per side or until it reaches an internal temperature of 165 F (74 C). Take diced sweet potato out of the oven and stir and return to oven for another 10-15 minutes or until fork tender. Add asparagus to a small baking sheet add a splash of avocado oil, sea salt and pepper and roast for 8-10 minutes. Dinner: preheat oven to 400 F (200 C) and preheat skillet over medium heat. Wash, dry and cut up chard, broccoli and leek. Add a splash of avocado oil to the skillet and stir fry leek until nice and tender, then add broccoli and stir fry, then add chard and stir fry. Place salmon fillet on a parchment paper lined baking sheet, season with sea salt and pepper, drizzle with some avocado oil and roast for 8-12 minutes. Sprinkle salmon with freshly chopped parsley and sesame seeds. * this post contains affiliate links and I might earn a small commission at no added cost to you if you purchase the product. Hello how do I get the rest of your paleo recipes? If I subscribe to your recipes, will they all be paleo? Hi Carmen, no, not all of my recipes are paleo. I have a lot of paleo recipes but many of them are not “labeled”. Thank you for voicing the interest though. I will definitely work on categorizing my recipes better. For now what you can do is type “paleo” into my search box and at least all recipes that are labeled or mention the word will pop up. Very good explanation. Thanks for sharing! Awesome. Glad I found your page and the one day paleo meal plan. Have just had brekkie and feeling great already. I find a lot of paleo recipes include cooking with coconut oils or coconut creams. Is there another alternative to coconut cream/oils as I am allergic to coconut. It depends on the recipe. In baking coconut oil is the best replacement for butter and coconut cream the best replacement for dairy cream. Coconut oil has the same consistency as butter (solid when cold and liquid when heated) and coconut cream is even creamier than 35% dairy cream. If you don’t have trouble digesting dairy I suggest that in baking recipes you use butter instead of coconut oil and 35% cream instead of coconut cream. For regular cooking, like frying onions etc. you can use avocado oil instead of coconut oil. That’s paleo, too. And for say granola or smoothies etc. you can simply use almond milk instead of coconut milk as it’s paleo, too. I cook with animal fat and a lot of it, because this diet uses animal fat and carbs from veggies and fruit as energy, instead of carbs so you will need the fats or you will feel tired. I feel bloated with this diet and don’t know why?? When I switch to healthier foods/get back on a diet, I get bloated. I think it’s a weird reaction to my body detoxing. If I stay on the diet eventually the bloating goes away. Is there a particular type of bacon for this diet? I usually buy the cheaper bulk buy bacon? Does it really matter which one? That sounds nice but its just not possible for me to be able to buy that and i can assume most people cant. I would say from the grocery store just read the labels check online to make sure the sources don’t have any bad conditions. This is a typical bodybuilding diet. It’s very similar to what I put my clients on. Just lower the fat, increase the protein . Its an excellent way of eating. You have more energy, cholesterol levels go down, and it’s simple to make. I’m so happy you like it Sami! No I don’t have more yet but I hope I can make more in the future. This post is really popular so I should really get going and create a second. Stay tuned. I would like more meal plans and recipes. Working on it Sandy :) It takes time though. Editorial calendar is pretty full with salad recipes for the summer. Can this be of help for someone who have leaky gut? There are some ingredients and food I am unable to digest. Hi Melanie, I recommend you talk to your doctor or nutritionist about this. I’m sure they can help you find the best diet for your condition. Unfortunately, I’m not familiar enough with leaky gut. I’m not sure what would be best for you. I wish you all the best. Is there a specific way to incorporating this if you have MS? Hi James, you would have to discuss this with your doctor or nutritionist. Unfortunately, I’m not familiar enough with MS to know which diet is best and incorporated in which way. I’m sorry I can’t be of more help. I have Hashimotos disease and am limited on what I can cook. This is a delicious healthy plan. After a week I FELT cleaner. My joints didn’t hurt and I had more energy. Thank you. Leah, I’m so so happy to hear that you seem to have found a great diet to ease your symptoms! I really hope you feel much better soon eating clean on a consistent basis. All the best to you! WOW! I’ve started paleo a little more than a week ago, and surprisingly I’ve lost close to 10lbs! I feel so much better eating clean food. I definitely recommend this. Thank you SO much for taking the time to come back and rate my recipe and leaving such wonderful feedback. I really appreciate it Robert! And kudoz for loosing 10lbs!! What a delicious and easy sounding meal plan. I love how thoroughly you explained all of this. What a great resource!! This explains a ton and is one I should bookmark for future reference.